kitesurfing in Costa Rica is great. We have an awesome six month full-on season and an interesting off-season for kiting on waves and other beaches away from Lake Arenal and Bahia Salinas. But, you may want to give other places a try. 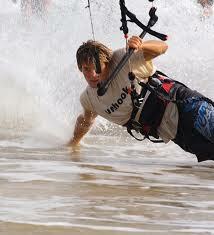 Book your kitesurfing holidays and get everything you need included. Lowest fares are guaranteed for each kite trip. Maintaining your kitesurfing equipment is easy as long as you do a little bit consistently over time to avoid major problems or deteriorating your gear. If you need some new or used kite gear in Costa Rica, check out our kitesurfing equipment page to find local retailers in Costa Rica, available brands, and other local options. These same sellers and distributors are your best bet to repair a kite, board, or any other equipment that needs fixing. Salt and sand can be the most abrasive substances on earth, especially when left unattended over time. They can destroy anything, including your lines, board, kite, harness, bar, and pretty much anything you bring out for a sessions, including your clothes. Before launching, remove all the sand that’s accumulated on your bar and lines. Pay special attention to high-friction areas like your bar’s center power line, pulleys, quick releases and line connection points. Always keep your pump clean. A dirty pump will put debris straight into your bladders which, as you can imagine, is not how you want your kite bladder to be. 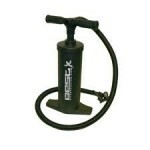 Give the pump a few strong pumps before connecting for inflation and that’s usually enough to clean the hose’s nozzle and keep it clear of sand. If your kite is wet, regardless of it’s state, let it dry before packing. You want to store it as clean as possible, which includes minimizing humidity along with all the other physical elements that might be stuck to your kite. If you can, give your kite, bar, harness and board a freshwater bath after every session. Wet gear can mildew or rust, so dry thoroughly. This’ll make sure you’re riding more and repairing less. Did you know… the sun’s UV rays and heat exponentially impact your kiteboarding gear’s life? Storing a kite in a hot car for a day can age seals and seams by a year. Even with materials built into kites and boards to prevent UV damage, UV rays cause material breakdown. Keep your kiteboarding gear young by storing it in cool shade when you’re not riding. Inspect thw area where you’ll be launching your kite before unpacking. Anything sharp including shells, twigs, rocks, and trash can lead to more holes, tears and breaks than anything else. If you’re in a ‘dirty’ area full of sharp edges, clear things before rigging or explore your options nearby. Also, look out for things lines can hang up on. If you snag your lines before starting it’ll get you off on the wrong foot, and at the end of the day it can leave a sour note to an otherwise awesome riding experience. When carrying kites in light winds, they need help avoiding the ground. Simply running will help keep everything airborne. In general, try to be gentle with your gear to prevent damage. Avoid using rocks (unless you have them in a protective bag) and kiteboards with sharp fins to hold down your kite. When turning your kite over, avoid dragging wingtips across the ground. If needed, just pinch the leading edge in to prevent dragging. Even though weather reports give you predictions and current wind conditions, observing the conditions firsthand is tremendously useful. In this article you’ll learn a few things that will help you forecast and read the weather. Conditions will vary throughout the coast in Costa Rica and at the two main kitesurfing areas in the country: Bahia Salinas / Playa Copal and the northern part of Lake Arenal known for its windsurf and kitesurf launch areas. Kiting in high-winds is exciting, or chilling, depending on how prepared you are and you’re level of kiteboarding skill. 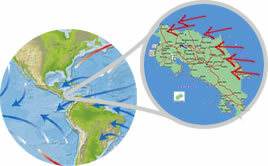 In Costa Rica, you get these high-winds consistently between December and February, or sometimes during the extended wind season from November to April. The top two spots for high-wind kiteboarding are both in the northern area of the country, Bahia Salinas and Playa Copal near the northern border and the top end of Lake Arenal. Did you know a 30-knot wind’s power is four times stronger than 15 knots? And yes, you’ll get 30-knot and occasionally even 40-knot winds in both Bahia Salinas and Lake Arenal. 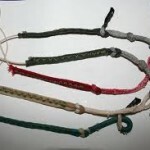 Mixing both the right kite size and style are key high-wind ingredients. Small, stable gust-absorbing kites offer more stability, depower and safety. And your board needs good bite. Narrower shapes with flex and larger fins allow more control in powered conditions. A harness that lowers your gravity center helps manage power. Also, be sure your gear is in immaculate condition. A small, unrepaired pinhole can break open under high pressure, so even if you go out in stable wind but hit high-wind gusts, it can be a spoiler. High winds are often products of unstable weather systems. They shift more in speed and direction than lighter breezes. Fortunately in both Arenal and Playa Copal the wind direction is relatively stable, but the wind gusts can really catch you by suprise if you don’t know what to expect. Especially when kiteboarding out of Playa Copal in Bahia Salinas, you’ll notice not just gusts, but also wind streams. You’ll want to ask about these beforehand so you can adjust and enjoy the wind streams between the beach and Isla Bolaños, which can give you an extra kick or where you’ll need to power down to avoid an uncomfortable or dangerous ride. Knowing what’s going to happen is just as important as what is happening. Study the weather and local area. Avoid shallow water, obstacles and crazy wind patterns. Check out the wind forecasts for Costa Rica and be prepared before you go. Strong winds require dedicated focus to every element, especially kite control. Since you’ll be riding smaller kites, everything is faster. 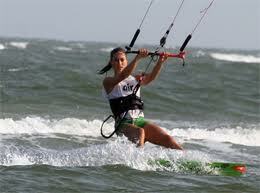 In Bahia Salinas we’ve seen kiteboarders using 3m and 5m kites, which lets you know it really can get strong sometimes. It’s not common, but definitely gets to that point a few days during the season. Your brain and reaction time must keep up. Slow and easy movements are vital. Know overpowered riding techniques. Keeping your kite low and board on edge decreases control loss by maximizing resistance. If you’re flying high, your kite’s probably too big and only your body weight is working for you.